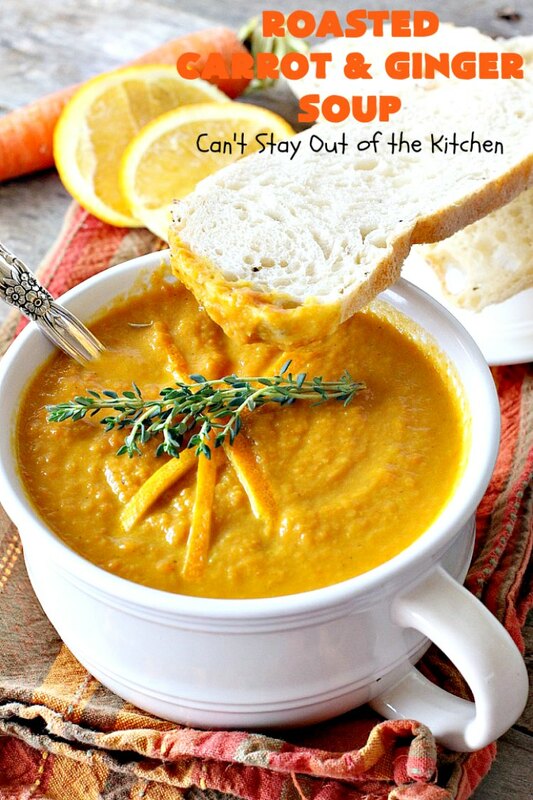 Roasted Carrot and Ginger Soup is delectable comfort food during the cool, winter months. I started out by roasting carrots, leeks, onions, garlic and ginger. Then I added them to a Dutch oven with orange peel and vegetable broth. After pureeing the soup I added coconut milk and some fresh thyme. It was thick, savory with just a hint of sweetness from the ginger and orange peel. I loved it! 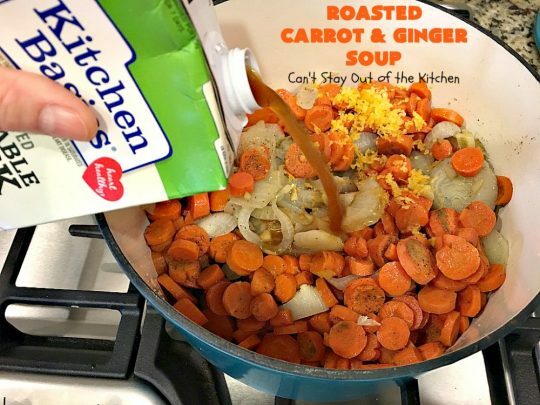 About five years ago I tried a Carrot and Ginger Soup recipe I saw online. I had taken pictures and everything and then sat down to eat a bowl. Yuck. It was awful. It was so bad that I couldn’t post it and threw the stuff out. That rarely happens but every now and then you have a bad experience with a recipe. I didn’t try to make it again for all these years. Finally, I was really wanting to make a soup with carrots and ginger and decided to go back to the drawing board and see what I could come up with. I was really pleased with how this version turned out. It’s creamy, smooth and delightful comfort food. 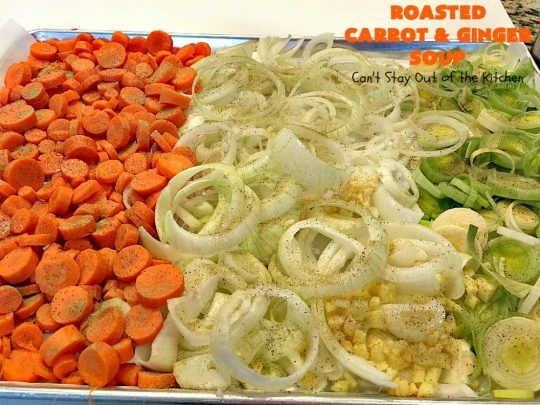 Roasting the veggies adds incredibly rich flavor. 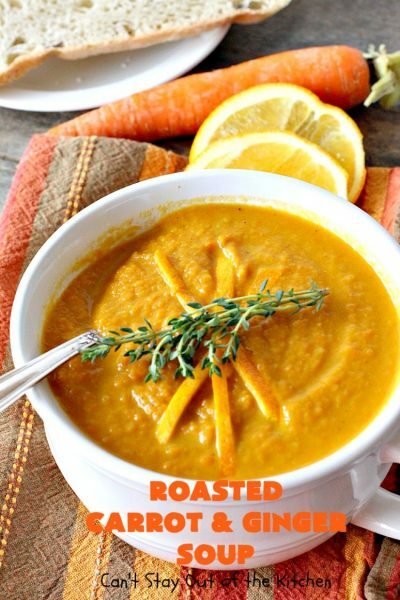 Roasted Carrot and Ginger Soup is a little more savory than some butternut squash soups. But it does have a touch of sweetness so it’s not a completely savory soup. 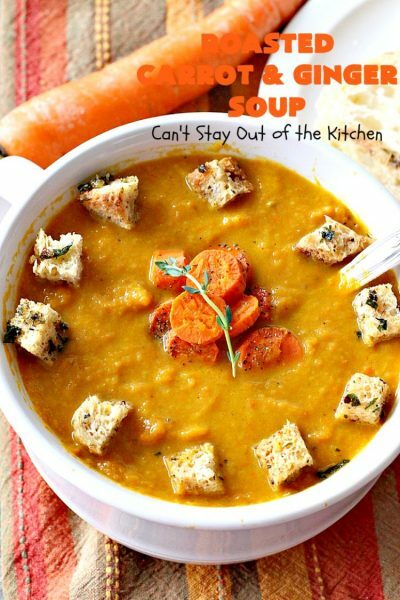 I really enjoyed it, but if you must have your soups sweeter, then you can always add a little honey if you desire. Or, you can add a fuji or gala apple (unpeeled but cored) when roasting the vegetables and that will provide a slightly sweeter taste if that’s what you prefer in soups. Roasted Carrot and Ginger Soup is a healthy, gluten free, vegan, low calorie and clean eating main dish. It’s terrific for Meatless Mondays and as leftovers for lunch at the office. I served mine with additional roasted carrots on top and Homemade Gluten Free Croutons (which I make all the time). 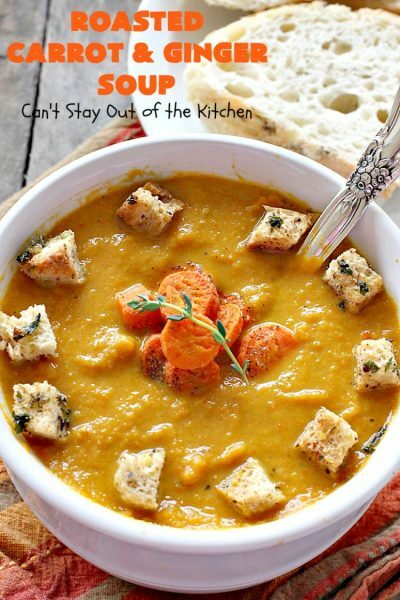 I loved mixing the crunchy carrots and croutons with the creaminess of the pureed soup. 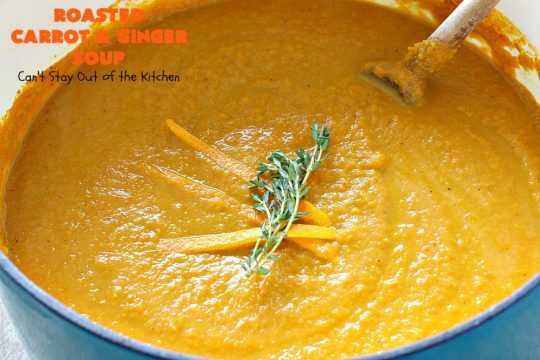 Roasted Carrot and Ginger Soup is delicious on cold, winter nights. 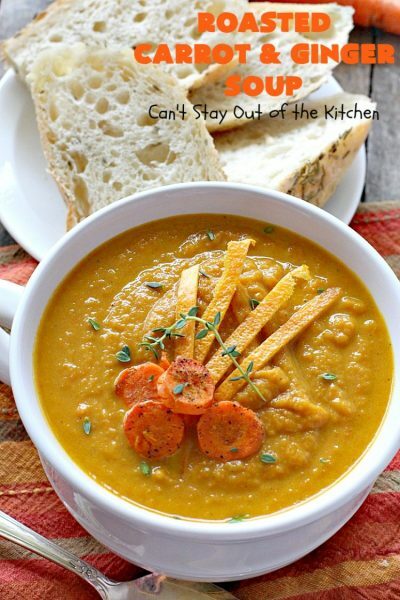 This soup is delicious with a Crusty Bread. Roasted Carrot and Ginger Soup has just a hint of orange peel and ginger. The flavors are terrific. Place a piece of parchment paper on a large cookie sheet. 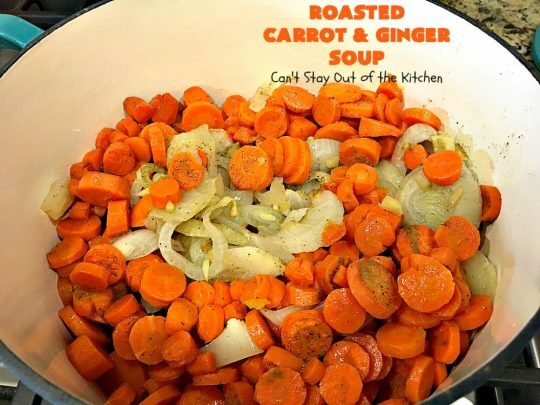 Add peeled and sliced carrots, onion rings, garlic, ginger, and sliced leeks. Drizzle avocado oil over top. Sprinkle generously with sea salt, pepper and thyme. Roast veggies at 400 for about 30 minutes. Remove veggies (and drippings) from parchment paper and put into a large Dutch oven. Add grated orange zest and vegetable stock. Heat through about 5-10 minutes. With an immersion blender, puree soup until smooth and creamy. Add coconut milk to slightly thin the soup and make creamier. Garnish with thyme leaves to serve. 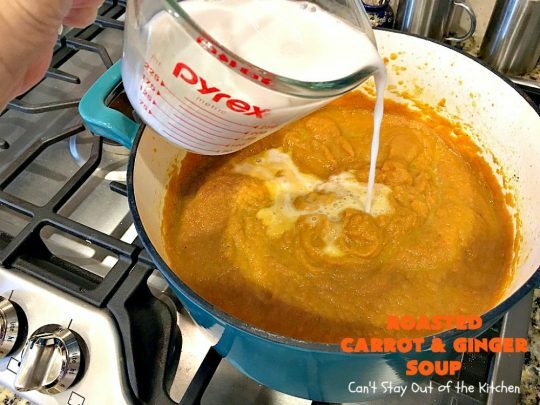 Roasted Carrot and Ginger Soup has the rich savory flavors of roasted vegetables which really amps up the flavors of this soup. 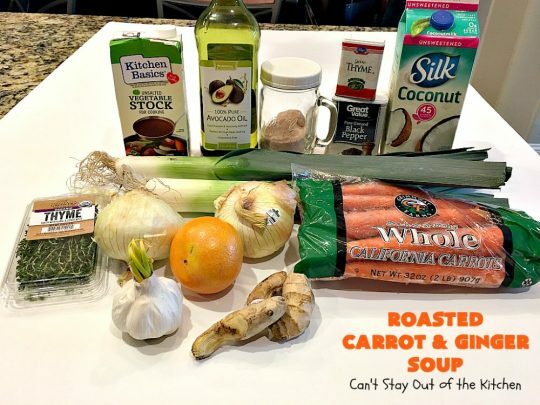 My personal preference was to serve this soup with Homemade Gluten Free Croutons and with some of the Roasted Carrots on top. I loved the crunchy and creamy together. Roasted Carrot and Ginger Soup has just a hint of orange peel and thyme. This delectable soup is perfect for cold winter nights. 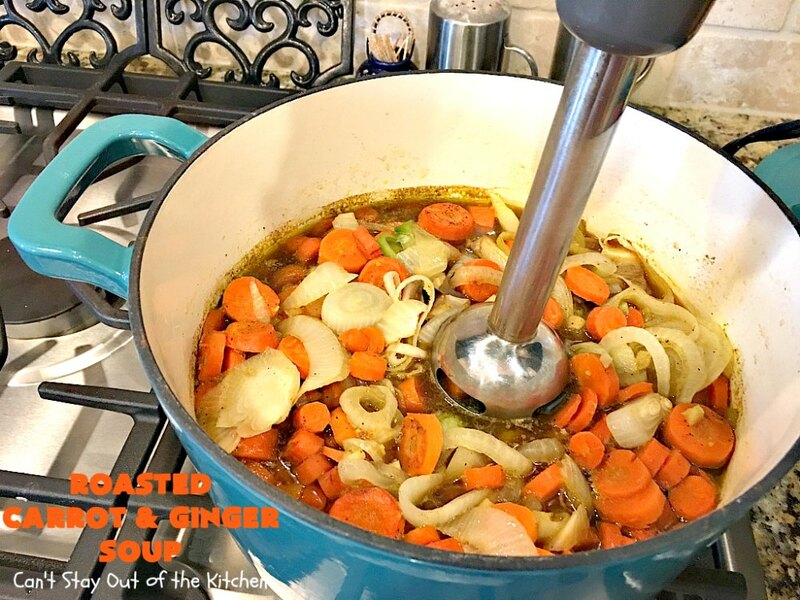 It's the ultimate in comfort food using roasted carrots, leeks, onions, garlic and ginger. It's seasoned with thyme and orange peel for a delicate balance of deliciousness you're sure to love. 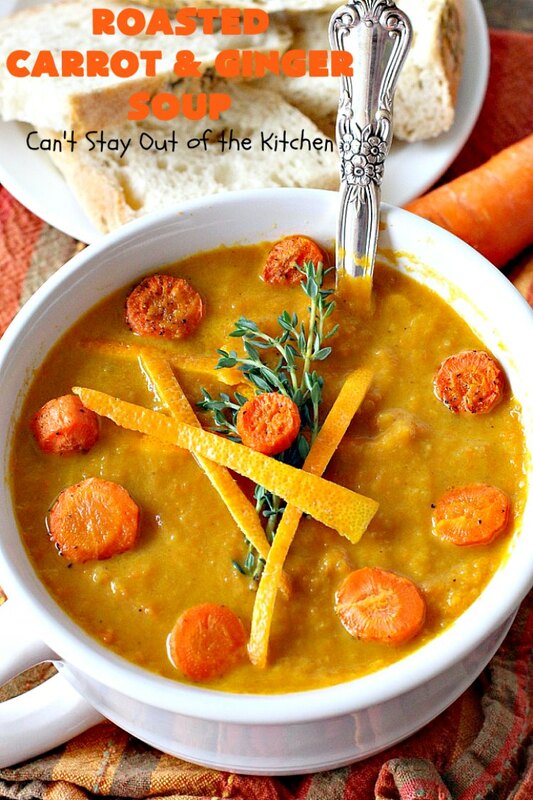 This soup is healthy, low calorie, gluten free and vegan. Spread a large cookie sheet with parchment paper. Slice carrots, onions and leeks and place on parchment paper. Add minced garlic and ginger. Brush veggies with olive oil. Bake at 400° about 30 minutes until veggies are cooked. 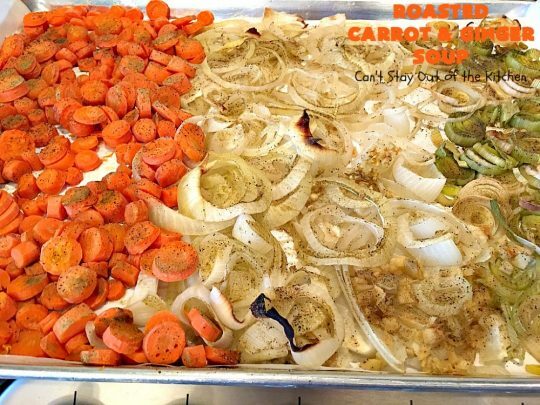 Remove veggies (including oil and seasonings) from parchment paper and pour into a Dutch oven. Add vegetable stock and orange zest. With an immersion blender, puree ingredients until completely smooth. 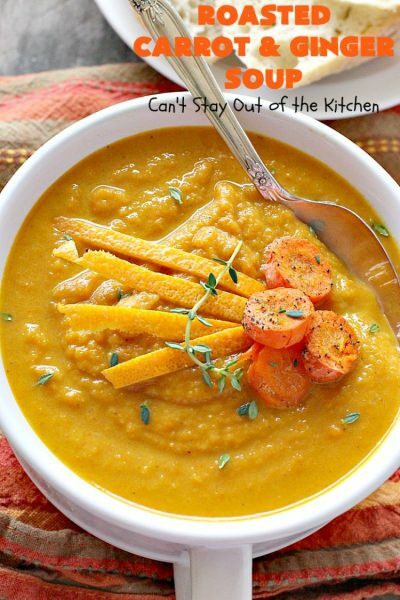 Stir in coconut milk as desired to get the texture you prefer. Ladle into bowls and garnish with fresh thyme, orange peel, roasted carrots or gluten free croutons, if desired. NOTE: You can also substitute almond milk, half-and-half or heavy whipping cream for the coconut milk, if desired. NOTE: If desired, you can save out about ¼ to 1/3 cup of the roasted sliced carrots for garnishing each bowl. NOTE: If you want a slightly sweeter soup, you can add a cored, unpeeled, chopped gala or fuji apple when cooking the veggies. You can also add a few tablespoons of honey. 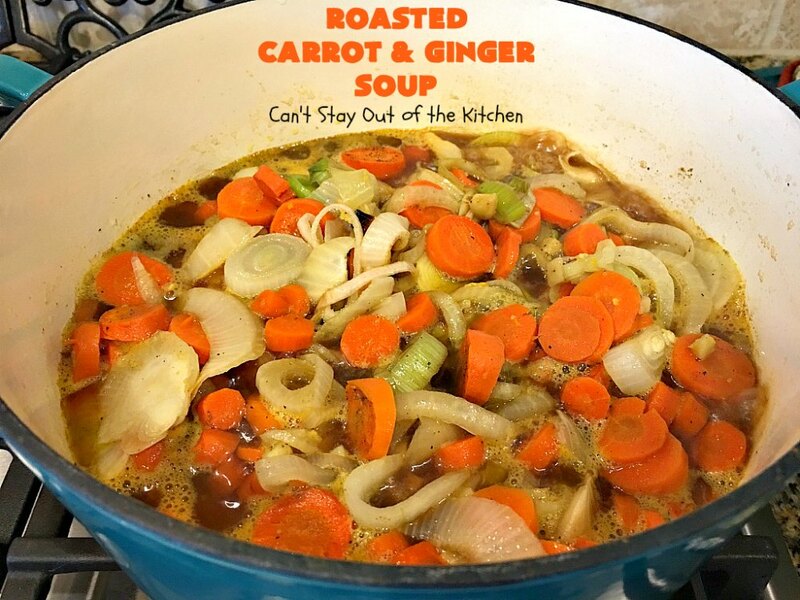 I loved the way this soup turned out and had it for lunches for a few days. Roasted carrots as a garnish added a little crunch to the creamy smoothness of this soup. 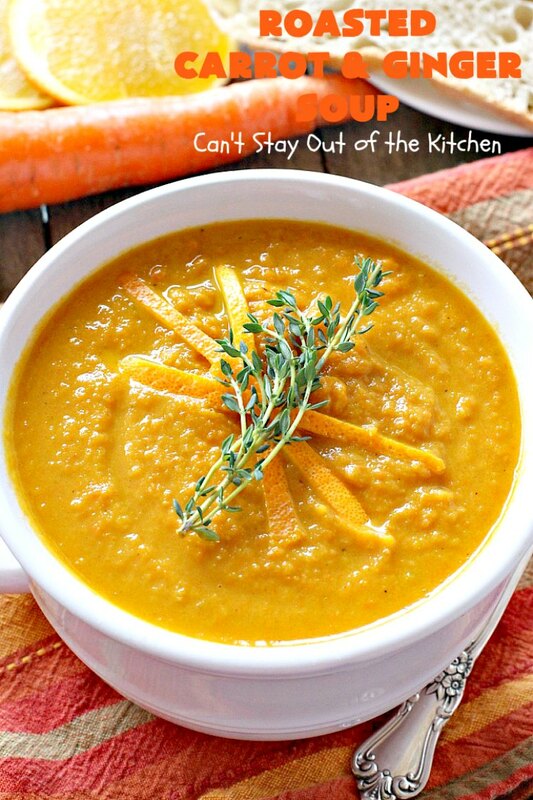 Roasted Carrot and Ginger Soup is healthy, low calorie, clean eating, gluten free and vegan.